We pride ourselves in having affordable English riding gear for the beginner rider to the most experienced. Not sure if you want to continue riding? Are you going to horse camp? Does your vacation include going to a dude ranch? We’ll set you up with affordable gear to get you started and keep you safe. Saxon or Dublin Paddock Boots are a must. When wanting a half chap, we offer them by Dublin and Horze, not to mention we carry the brown half chaps to match with your All Terrain H2O boots by Ariat. We can fit you in a helmet by Tipperary, Toklat or Troxel … we even have pink and purple for the lil’ gals. Hunt & Jumping are becoming more and more popular each year. You’ll need an Event or Competitor vest by Tipperary. Yes, we have riding gloves, by Heritage and Noble. 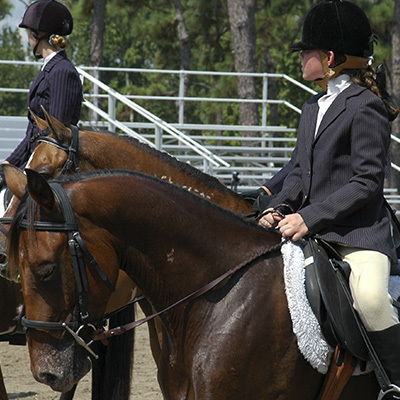 We have an extensive selection of breeches for all ages, the every day riding and show. You’ll see we carry Kerrits, Ariat, Irideon and Horseware.